BoardGaming.com> Games> Board Games> Revolution! Secretly bid against your opponents to gain the support of the people, win territory... and collect more Gold, Blackmail, and Force for the next round of bidding! Will you try to control the tavern or the fortress? The harbor or the plantation? Knowing where to push for support – and where to back away and let your opponents fight – is the key to victory. It's a game of bluff, counter-bluff, and surprise. 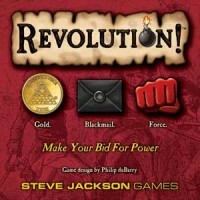 Revolution!, by Steve Jackson Games, is comprised of 1 game board that represents the town in which the players will vie for power, 100 Influence cubes (in 4 different colors, 25 per player), 4 Score tokens, 4 Bid boards, 4 Player Screens, and 56 bid resource tokens (12 Force, 12 Blackmail, and 32 Gold). The game components are made of thick and very durable cardboard along with the cubes which are made of wood. The components of the game are of excellent quality. Before the game beings, it is important for all players to understand what resources they have at their disposal and what they are attempting to gain. The object of the game is to have the most support by the town elders and other influential persons at games end. To gain support, you must use the resources in your possession. These are threats (Force), having access to compromising material (Blackmail), and wealth for bribes (Gold). The game is played out with all players taking the same actions at the same time during 4 different phases. As a group, the players will complete the following phases in sequential order. Every Player is aware of what resources each player has available at the beginning of each round. Each player now places their bids behind their player screen. Each on may place as much or as little of their resources as they like on the officials but can bid on no more than 6 at a time. Once all players have placed all their currently available resources, the Player Screens are removed. Now all the Bid boards beginning with the upper left most official (the General) and moving to the right, the top row are determined. .A player influences and gains support of that official and it’s rewards. All used resources on the Bid Board are returned to the resource piles. Any gained resource are kept and set aside for the next round. At the end of the round, the secret and silent backer of each player will provide enough gold to ensure that each player has at least 5 resources to start the next round. The game ends when all the Influence spots on the game board have been filled at the end of Phase 3: Resolution. The players now count up their points and adjust their Score tokens as needed on the outside Support track. Once all the counting has been completed and the Score tokens have finished being adjusted, the player with the most Support points wins the game and the town. Revolution! has become a family favorite in our house. The relatively easy learning curve and fast pace keeps everyone interested. The short playing time is also a plus for younger/newer players. The difficulty of game play and strategy is totally determined by the experience level of the players involved. While this is certainly a “light” game is does have several elements that even avid gamers will find intriguing. Even though it is essentially a game of modified rock, paper, scissors, Steve Jackson’s Revolution is an eminently playable game of ***************** goodness. In Revolution, players are seeking to gain the greatest amount of influence in town, by way of controlling specific areas of the town- the harbor, the tavern, the cathedral, etc. Influence cubes are placed within squares in each building, shown on the game board, and the player with the most cubes in the building receives victory points, listed next to the building on the table. Influence cubes are distributed by the use of Force, Blackmail, and Gold (Force is stronger than Blackmail and Gold, Blackmail is stronger than Gold). These tokens are earned through a blind auction at the beginning of each turn. You are betting to…’persuade’ prominent members of the town, such as the Admiral, the Printer, the Spy, etc. If you are able to sway these individuals to your side, you receive either influence within a building, raw victory points, Force/Blackmail/Gold, or the ability to shift Influence Cubes throughout the board…be they yours or your opponents. This mechanic plays out wonderfully with four players (or five to six with the expansion) as players are consistently getting outbid on which town members they are bribing/forcing/blackmailing. If you are playing with three players in your gaming group or household, however, I advocate that you avoid this game. Three is simply too few to play a balanced game, and one person usually ends up dominating by chance. A good, if not great, game for four to six players, though. One of my good friends says that this is Steven Jackson’s best game and although I have not played that many of his I would tend to agree. It’s a very simple but fustrating game to play. The rules are simple. Fill the board with your people/cubes and who ever has the most points at the end of the game is the winner. The hard part is getting your cubes on the board cause you’re all bribing/blackmailing/using force to get your cubes on and if 2 people tie no one gets it. The game works like this: you have a board with certain people who can be influenced by using force, blackmail or money which allow you to place your cube on the board but if two people tie neither gets is and force is stronger than blackmail which is stronger that money. Some people can only be influence by 2 of the 3 methods (ex blackmail can’t be used). Some spaces let you move cubes around and others just give you points. No 2 games will be the same so you can play the game over and over and never get bored. Good game and I suggest you try it and you’ll see it’s a good time. We were introduced to this game at our local game shop and we tried it out while waiting for more people to gather for game night. There were 5 of us playing and it was a lot of fun. This game for me was all about bluffing and calling others bluff. It was fun on both sides to bid and hope to get away with something. More often than not I’d misread someone and end up paying for it. A simple to understand game (verbally taught to us in less than 5 minutes), we all caught on quick and ended up playing multiple games of it even after others started showing up. I’d like to play it again, we may even pick up a copy. Add a Review for "Revolution!"